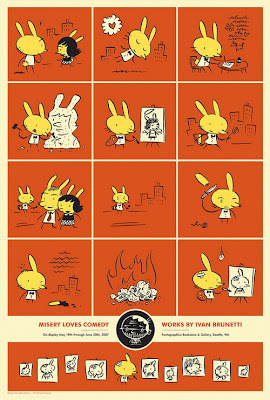 Ivan Brunetti says: "One of the most difficult parts of being a cartoonist is being your own editor, since every line affects every other on the page. Perhaps the single most difficult part, however, is just starting a page. One trick is to make sure you draw something, even one panel, before going to bed; it will raise your spirits and 'carry' you over into the next day's work. Do not wait until you are 'in the mood' to draw, or until you 'snap out of your funk'. You must force yourself to draw even if it feels joyless and pointless. You will feel better the next morning. Feeling follows behaviour, not the other way around, as my therapist constantly has to remind me. Finally, both Seth and Chris Ware have told me this, and I have grudgingly come to realize that they are absolutely right: when you sit down to draw, you should 'dress for work'. Have respect for your craft. Put on a pair of pants."